“We’ve had 50 years of unusually stable weather… What do we need to do now, to garden in times that are less predictable?” Plant breeder Carol Deppe, author of The Resilient Gardener: Food Production and Self-Reliance in Uncertain Times, suggests growing a wider variety of crops adapted to conditions where you are; crops needing minimum inputs; and varying gardening patterns with the year. “Short season crops are a premium,” she asserts. She discusses seed saving, and storing enough seeds so everyone in your neighborhood can be gardening if need be. 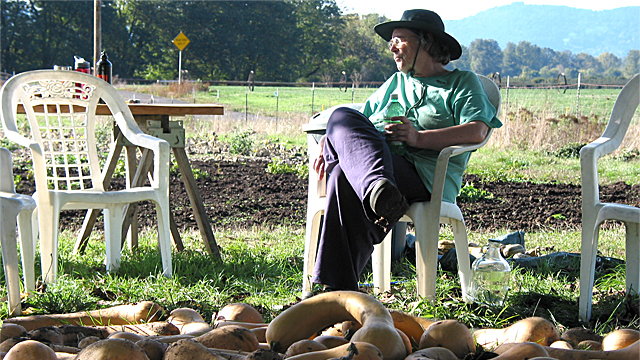 She’s a big fan of growing potatoes and squash to extend each season’s food, plus beans and corn for long-term storage. Carol is breeding seeds with resilience for unpredictable conditions, including open source seeds which anybody can use as they wish without patent restrictions. [caroldeppe.com, osseeds.org].